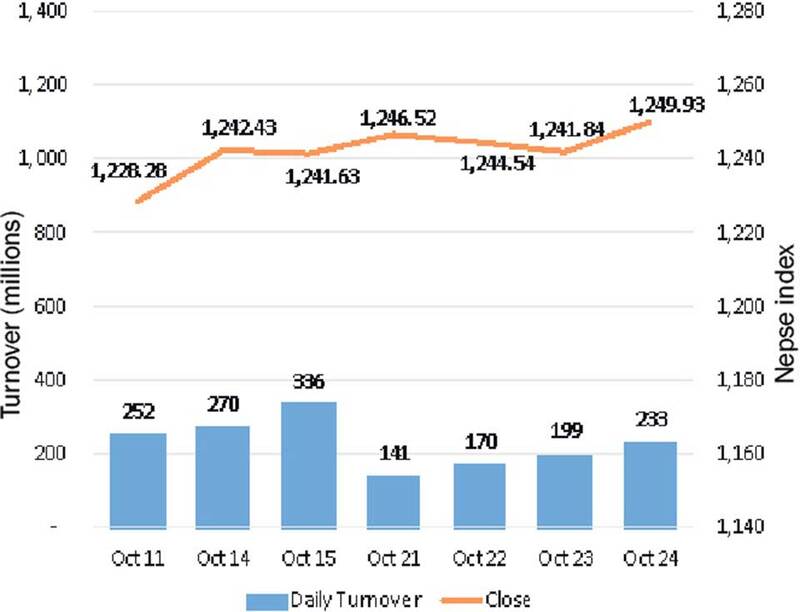 KATHMANDU, Oct 25: Nepal Stock Exchange (Nepse) index gained 8.09 points to close at 1,249.93 points on Wednesday. Though the market lacked vigor till afternoon, a surge in the final trading hour pushed the benchmark index to green penultimate trading day of the week. 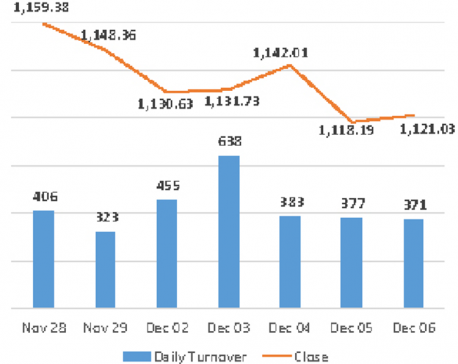 With the day’s gain, market activity also improved as the bourse recorded a total turnover of over Rs 232 million. On sectoral front, all major sub-indices mirrored the broader market and ended in green. The biggest gain came from Hotels stocks as the group’s sub-index rallied 3.8 percent on the day. ‘Others’ and Non-life Insurance sub-indices also posted a significant movement to the upper side, gaining over 1 percent each. Meanwhile, Manufacturing & Processing sub-index also climbed 0.92 percent. Sub-indices of Hydropower, Banking and Life Insurance stocks followed suit and edged higher. In terms of market participation, Prabhu Bank Ltd continued to lead the list of companies in terms of turnover. More than Rs 33 million worth of the bank’s shares were traded on the day. Next on the list was NIC Asia Bank Ltd which saw Rs 12 million worth of shares change hands. Similarly, Kumari Bank Ltd and Siddhartha Bank Ltd posted turnover of more than Rs 10 million each. Among others, shares of NMB Bank Ltd, Machhapuchhre Bank Ltd and Nepal Telecom Ltd were also actively traded on the day. Panchakanya Mai Hydropower Ltd turned in the best performance of the day as its share price appreciated by almost 6 percent. Similarly, share prices of Oriental Hotels Ltd and United Modi Hydropower Ltd jumped by 5.73 percent each. Global IME Laghubitta Bittiya Sanstha Ltd also added 5.30 percent on its share price. The company has scheduled its annual general meeting (AGM) for November 15. Distribution of 15 percent bonus shares and issuance of 100 percent right shares are among its agendas. Besides, Samata Microfinance Bittiya Sanstha Ltd, Soaltee Hotel Ltd and Siddhartha Insurance Ltd were the other top gainers of the day. Conversely, Century Commercial Bank Ltd Promoter Share posted the biggest loss of the day as its price plunged by 5.06 percent. Further, share prices of Mirmire Laghubitta Bittiya Sanstha Ltd and Kalika Power Company Ltd fell by over 3 percent each. Other losing securities include Global IME Sammunat Scheme-1, World Merchant Banking & Finance Ltd and Shree Investment Finance Company. On the corporate front, Womi Microfinance Bittiya Sanstha Ltd published financial report of the first quarter of Fiscal year 2018/19. The micro sector lender reported a 48.56 percent increase in its net profit to Rs 10.87 million. In other news, NIC Asia Bank Ltd is set to issue 11 percent NIC Asia Debenture 2085-86 worth Rs 4 billion. The issue is subject to approval from the Securities Board of Nepal (Sebon). ARKS technical analysis indicates the market forming a bullish candlestick on the daily timeframe. Following the day’s gain, the momentum has slightly shifted toward the bulls as presented by technical indicators. The index also trends above its 20- and 50-day Exponential Moving Average (EMA), indicating slight strength in equity market. 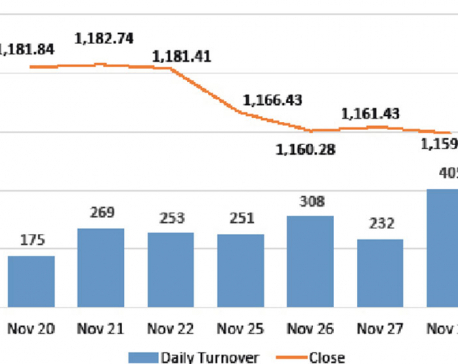 However, since the turnover has remained relatively low in the recent sessions, a major shift in the trend is yet to be observed.